What Else Can I Expect from an Online Bachelor's in Emergency Management? Emergency management is a field dedicated to protecting resources and ensuring public safety in the event of a catastrophe, such as an earthquake, hurricane, flood, terrorist attack, or any other crisis. Professionals in the field create contingency plans in order to prepare for different emergency situations. They also coordinate relief efforts with elected officials, government agencies, and nonprofit organizations in order to effectively support all individuals impacted by the emergency. Subdivisions of emergency management include law enforcement, homeland security, cybersecurity, and public health. Over the last two decades, emergency management has become a popular undergraduate major. The curriculum in an emergency management bachelor's program covers a range of topics: Areas of focus include supplies and logistics, victim services, natural resource management, epidemiology, law, and policy. Many emergency management degree programs include optional or required internships, which allow students to receive supervised hands-on training from experienced professionals at government offices, call centers, and other working facilities. Today, many students are choosing to earn their bachelor's in emergency management online. Distance learners follow the same rigorous curriculum as their brick-and-mortar counterparts, and they have the flexibility to take courses at their convenience. The asynchronous (self-paced) format used by many online emergency management programs is also ideal for students with part-time jobs, childcare responsibilities, or any other commitments that may interfere with campus-based learning. Read on to learn more about emergency management, and to discover what kind of career opportunities you can pursue with a degree in the field. WILL AN ONLINE EMERGENCY MANAGEMENT BACHELOR'S PROGRAM PROVIDE ME WITH THE SKILLS I NEED TO ADVANCE MY CAREER? Online bachelor's in emergency management programs will prepare students for different emergency situations. Many online emergency management programs allow students to earn specializations in disciplinary subfields, such as cybersecurity, law enforcement, or fire protection. These specializations can help direct your professional opportunities after graduation. WILL AN ONLINE EMERGENCY MANAGEMENT BACHELOR'S PROGRAM WORK WITH MY SCHEDULE? Online emergency management programs offer a flexible alternative to traditional brick-and-mortar classes. The online format is ideal for students who have to juggle schoolwork with other important commitments, such as childcare or a full time job. Distance learners can access course materials, submit assignments, take exams, and contact professors at their convenience. Current technology also allows students to study away from their home computer using a laptop, tablet, smartphone, or other portable device with Wi-Fi compatibility. WHAT JOBS CAN I GET WITH MY EMERGENCY MANAGEMENT BACHELOR'S DEGREE? Most careers in emergency management are attainable with a bachelor's degree, although a specialized degree or work experience may be required for some advanced positions in the field. Common career pathways for degree-holders include roles as emergency management directors, project managers, logisticians, cybersecurity specialists, and nonprofit administrators. Some jobs, such as positions in epidemiology, are typically reserved for candidates with a graduate degree in their field. WHAT ARE THE BEST ONLINE EMERGENCY MANAGEMENT BACHELOR'S PROGRAMS? Choosing a program is a very personal decision, and only you can properly evaluate whether a target school's strengths match your educational needs and professional ambitions. 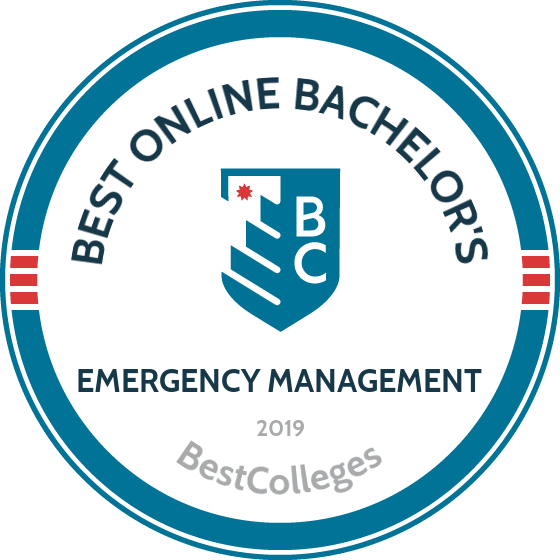 The following ranked list of schools should serve as a helpful starting point in your search for the best online bachelor's in emergency management programs in the United States. If you are considering an online bachelor's in emergency management, be sure to contact admissions specialists at different colleges and universities to learn more about their specific degree requirements and offerings. With a vast, sprawling campus based in Gainesville, the University of Florida boasts one of the nation's most vibrant digital offerings. UF Online hosts dozens of web-based programs, from professional certificates to doctoral-level degrees, including an online emergency management degree. UF's online bachelor of science in fire and emergency services combines fire science, EMS, and emergency administration into one rigorous program. This degree does not confer any licensure or certification; instead, it positions fire service and EMS professionals to step into leadership roles. UF's course of study follows a 60-credit curriculum that focuses on fire science and incident command. Core classes include communications and IT, strategic planning for emergency services, and disaster planning and control — each teaching students the fundamentals of modern emergency management. Specializations in fire, emergency management, and EMS allow participants to tailor their studies to their career goals. Those enrolled in the fire service concentration need certification or some experience in the field and at least 60 credits to their name before they apply. The EMS and emergency management tracks both welcome less experienced applicants. Most courses are offered in an asynchronous format. The school's tuition is among the lowest around, particularly for students who qualify for in-state rates. The program typically takes 2-3 years to complete. One of New Jersey's 11 public universities, Thomas Edison State expressly serves working nontraditional learners. From its campus in Trenton, TESU offers a variety of programs to nontraditional students. The school offers more than 50 degrees, including a homeland security and emergency management degree online. The 120-credit program focuses on policy issues and emphasizes the National Preparedness System's five core principles: prevention, protection, mitigation, response, and recovery.TESU takes an interdisciplinary approach in its bachelor of science in homeland security and emergency management. The program views emergency management through law enforcement, homeland security, and business continuity. Participants learn the decision-making skills needed to lead in the post 9/11 world, taking 60 general education credits and 33 core credits in the major. Remaining credits include elective options like white collar crime, gangs, and organizational behavior. The university typically offers all courses in asynchronous, 12-week sessions. The school also offers "e-pack" classes that feature no interaction with others. Distance learners can transfer up to 80 credits and can also earn credits for prior knowledge. TESU grants credits for military service, work experience, and volunteerism using its own portfolio assessment program. High achieving students can join the national honor society of homeland security and emergency management: the Order of the Sword and Shield. TESU begins new undergraduate classes every month, making it simple to get started. Located between Birmingham and Atlanta, Jacksonville State began in 1883 as a small teacher's college. Since that time, JSU has grown into one of Alabama's most comprehensive regional universities. Today, JSU features a robust offering of highly regarded, web-based programs through its digital arm, Online@JSU — including an online emergency management degree. The program offers two concentration tracks: homeland security and public safety telecommunications. The university designed the EMS major to prepare students for work in local, state, or federal government or in volunteer or business settings. The 128-credit curriculum of JSU's bachelor of science in emergency management is divided between 98 credits of general education requirements and 30 credits of major coursework. The two tracks take distinctly different approaches, but both emphasize theory and the practical applications of that theory. The homeland security track features core classwork in critical infrastructure, planning and preparedness, terrorism, and weapons of mass destruction. The public safety telecommunications track explores public and interpersonal communications, crisis intervention, and legal issues in communications. While courses are offered in both synchronous and asynchronous formats, students complete all coursework online, with no on-campus requirements. Most program participants complete their studies in four years. JSU offers extremely competitive tuition rates. The Southern Association of Colleges and Schools accredits all programming at the university. The University of Alaska - Fairbanks uses its e-campus to offer educational opportunities to people in the remote corners of Alaska. Located in the state's third-largest city, the school provides access to a variety of University of Alaska online services, of which the emergency management bachelor degree online proves an example. The university created its bachelor of security and emergency management program to prepare graduates for careers in homeland security; city, state, and federal emergency response; non-governmental organizations; and public safety agencies. The 120-credit curriculum consists of ten core classes and UAF's general education requirements. Students can pursue a concentration in five different areas: homeland security, emergency management, fire administration, cybersecurity, and EMS management. UAF features small class sizes and a faculty that brings a wealth of experience from emergency services. Most courses run asynchronously, and the program is designed for completion within the four years of a traditional bachelor's. The university boasts a generous transfer policy and awards credits for military service and work experience. Tuition is competitive with similar programs. Admission requires the submission of previous educational transcripts with a minimum 2.5 GPA. Applicants who do not meet the minimum standard must take the SAT or ACT. Founded in 1889 to provide educational opportunities to the communities of western North Carolina, Western Carolina University now offers programming to over 10,000 students across the globe. Part of the North Carolina public university system, the Cullowhee-based institution's dedicated digital arm hosts more than two dozen web-based programs. WCU's online emergency management degree features an internship, giving students an opportunity to gain experience in the field and allowing them to pursue a minor in a related field. WCU's interdisciplinary curriculum breaks down into several parts. To earn a BS in emergency and disaster management, students must complete 49 major credits, 42 credits in required liberal studies, 21 major electives, and 29 general elective credits. Internship participants receive as many as 12 credits for their field experience. Most faculty members conduct courses asynchronously, which allows students to learn at their own pace. WCU makes all credits needed for the degree available online, and program participants can even take classes at other schools in the UNC online system and apply them toward their degree. WCU allows students to transfer credits from community college classwork in fire science, emergency medical, or emergency management. Half of earned degree credits and half of all courses in the major must be at the 300/400 level and reach a minimum 2.0 GPA. Online students can access many of the same resources available to those enrolled on campus. These include tutoring, advising, and career services. The largest institution of higher education in Washington, D.C., George Washington University welcomes students from all across the U.S. GW Online offers a unique take on an online emergency management degree. The school's 120-credit program focuses on the healthcare end of the emergency spectrum, readying students for exciting administrative positions in emergency medical services. GW's bachelor of science in health sciences in emergency medical services management requires degree candidates to earn 120 total credits, 60 of them in the major core. The degree completion program allows distance learners to transfer in as many as half of their credits. At least 60 must come from GW itself to meet residency requirements. The entire curriculum takes place online, and all courses run asynchronously. The curriculum looks at all facets of EMS management, including policy, personnel administration, legal issues, finance, and bioethics. The dynamic online program also explores incident management, deployment of resources, special operations, and even homeland security. Instructors bring a wealth of experience in medical and emergency fields. Applicants are required to have completed an EMT B course, though those without this credential may gain provisional admission. Applicants should hold a minimum GPA of 2.5 on previous college coursework. Set in Nebraska's largest city, University of Nebraska Omaha created its emergency management degree programs online by bringing together a diverse array of university departments, public safety professionals, and community leaders. The group's two-year project resulted in a unique degree in emergency management, one which allows students to add two concentrations in a wide variety of fields. These include specialties in tribal management, gerontology, IT and communication, and nonprofit management. UNO's 120-credit curriculum requires 40-46 credits in general education classwork in diversity, composition, mathematics, social studies, and the natural and physical sciences. The major itself consists of just 30 credits in topics such as incident command, policy, agency collaboration, and statistics and data processing. Students split the rest of the required credits between their two, 15-credit concentrations and electives. The school’s bachelor of science in emergency management requires students to complete an internship and culminates with a capstone project. The university makes every credit available online in asynchronous format, allowing working professionals to attend class wherever and whenever convenient. Applicants should hold a high school diploma or GED with a 2.5 GPA. Applicants with less than 24 transferable credits must also supply SAT or ACT scores. Founded in 1971 in Albany, New York, Excelsior College focuses exclusively on providing educational opportunities for nontraditional learners. The nonprofit college offers more than 30 digital programs, including an online emergency management degree. The 120-credit program gives professionals the opportunity to advance their careers in response to natural and man-made disasters, dangerous events, and security threats, including cybercrime. In Excelsior's online bachelor of science in homeland security and emergency management, students learn foundational skills in emergency response. The program emphasizes effective coordination among agencies at the local, state, and national levels. It also promotes the analysis of threats, problem-solving, and ethics in emergency management. The school gives distance learners leeway in creating their own courses of study. While each must complete the liberal arts studies of a traditional bachelor's degree, they can use nine credits in an emphasis area to pursue their own career goals. Excelsior's transfer policies award students credit for a wide-range of life experiences, including military service, prior certification in first-response, FEMA training, healthcare credentials, and previous work experience. This generous policy allows program participants to transfer as many as 117 credits toward their degree, making it possible to earn your degree from Excelsior with only a capstone course and a 1-credit literary information class. The school places no time limit on credits earned. A mid-sized member of Wisconsin's system of higher education, UW-Oshkosh hosts an online emergency management degree focused fire service. Built with the help of fire chiefs, the program’s sole purpose involves training the next generation of fire service leaders. The degree caters to currently working fire and rescue professionals, but it admits anyone interested in the management of public health and safety agencies. One of the nation's top fire-response programs, UW-Oshkosh's degree received accreditation and recognition from prestigious organizations including the International Fire Service Accreditation Congress and the U.S. Fire Administration. UW-Oshkosh's bachelor of science in fire and emergency response management comprises 120 credits, 40 in the school's general studies curriculum. Program participants may select from two emphasis tracks: fire services management and emergency management. Coursework tackles subjects like personnel leadership, policy, budgeting, legal issues, and occupational safety. Distance learners can access everything they need online in an asynchronous format. Classes follow an accelerated, seven-week schedule, giving students a chance to accumulate needed credits quickly and finish within two years. The university boasts a generous transfer policy, accepting up to 90 credits toward the degree from accredited college work. Students can use military experience, National Fire Academy and FEMA credits, and other first-responder credentials to gain additional credit. Admission to the highly competitive program requires applicants to have an associate degree in a related discipline, firefighter one and two or EMT basic certification, or three years of full-time experience. Founded as a flying school in 1925, Embry-Riddle has developed into a leading online university, with dozens of degree programs to distance learners. Today the Daytona Beach-based institution's Worldwide digital campus delivers degrees and certificates in a wide range of disciplines, including engineering, communications, cybersecurity, and entrepreneurship. The school's emergency management bachelor degree online takes a fire science focus and numbers among the few programs nationwide to carry certification from Fire Emergency Services Higher Education. The university also holds accreditation from the International Fire Service Accreditation Congress. Students pursuing Embry-Riddle's online emergency management degree select from tracks in fire and emergency services and the unique specialty of aviation emergency management. While focused on fire response, the bachelor of science in emergency services' 120-credit curriculum delves into emergency medicine, investigation, engineering, aircraft rescue, environmental and hazmat response, security, OSHA, and dispatching. It applies to professionals in other emergency areas as well, and the university allows students to use electives to complement their degree with any minor in its catalog. When distance learners earn credits in these courses, they pick up additional certification from the National Fire Academy, as the degree follows the academy's own curriculum. Faculty have a strong background in emergency services, and they deliver coursework asynchronously, allowing students to continue working while they study. Degree seekers can pursue their degree entirely online, with no on-campus requirements. A mid-sized public university located in the historic community of Natchitoches, NSU offers a wealth of online certificate and degree programs, including one of the nation's leading online emergency management degree programs. The e-NSU program readies students for professional roles in local, state, and federal public-service agencies. NSU's bachelor of science in unified public safety administration provides a broad education in emergency response. The 123-credit curriculum requires participants to earn a total of 43 major credits, and students can enroll in four different specialty areas: law enforcement administration, emergency management administration, fire and EMS administration, and public facilities management. All feature core coursework in effective communication skills, analytics, policy, personnel management, and stress problem-solving and planning. The university offers classes online in accelerated, eight-week terms, and students typically take two courses per term. Most coursework employs an asynchronous format, but degree candidates occasionally meet for online sessions. A senior seminar provides an opportunity to synthesize everything learned into a culminating class. NSU offers extensive credit through its Prior Learning Assessment program. Students can earn credits for military service and work experience using an intensive portfolio-development class. Admission to the online emergency management program requires at least a minimum 2.0 GPA and acceptable grades on the ACT exam. Many applicants may also need to take the ACCUPLACER test. Launched in 2008, Arkansas State's online campus, A-State Online, boasts more students than many other university in the state. More than 5,000 distance learners enroll digitally in over 35 degree and certificate programs through the Jonesboro-based public institution. A-State offers an emergency management bachelor degree online, with a focus in disaster preparedness. In this 120-credit course of study, students explore the best practices in disaster planning, mitigation, response, and recovery under the tutelage of an experienced faculty. A-State's bachelor of science in disaster preparedness and emergency management includes a total of 60 major credits. Courses take students through topics like incident command, hazardous materials, pandemics, risk identification, community response, and research methods. Degree candidates must also choose an emphasis area. Options includes law enforcement, healthcare, administration, and disaster preparedness. This concentration consists of 15 credits. The school's general education studies take up another 35 credits, which must involve a math course and 12 credits of social sciences. The university grants as many as 30 credits from work experience, military service, and volunteerism. Most faculty deliver courses asynchronously. Students must also do a practicum in disaster preparedness with an approved agency outside the university. Applicants must first gain acceptance to the university and then admittance to the program itself. Admission requires a GPA of 2.75 or better and scores from the ACT or SAT from the past five years. The school may offer conditional admission to students with GPAs as low as 2.3. Bellevue University began in 1966 as Bellevue College, an institution focused on providing educational opportunities for adult students in the region. The college achieved university status in 1994 and began offering online programs two years later, one of the first accredited universities in the country to do so. The university holds accreditation from the Higher Learning Commission. Bellevue offers an online emergency management degree comprising 127 credits, 40 of which include courses in the major. Students take classes on subjects such as emergency communications, natural disasters, emergency planning, terrorism, and legal issues in emergency management. The university also offers the emergency management degree on campus. Once students begin their major coursework, they progress through the program as a cohort, no matter which delivery system they pursue. The program requires students to complete a capstone project prior to graduation. The university offers a liberal transfer credit policy. It typically accepts all credits from regionally accredited associate degrees. However, transfer students must complete a residency of at least 30 credit hours at Bellevue. At least 12 credit hours of this residency requirement must come from upper-level major coursework. Louisiana State University Alexandria began as a two-year commuter college in 1959. It only offered associate degrees until 2001, when the Louisiana Legislature authorized the school to offer baccalaureate degrees. The Southern Association of Colleges and Schools Commission on Colleges first accredited LSUA in 1974. The university maintains this accreditation. The university's History and Political Science Department offers a bachelor of general studies degree with a concentration in disaster science and emergency management. Students can complete the program 100% online. The degree consists of 120 credits, with 27 comprising major coursework on topics such as introduction to geographic information systems, remote sensing, and public health emergency preparedness. In addition to general education and elective courses, LSUA requires students to enroll in 12 credits of enrichment block courses. Enrichment courses are closely related to a student's concentration. Disaster science and emergency management students can complete enrichment courses in business, criminal justice, or psychology. Online programs at LSUA include several start dates throughout the year. The university only accepts applications for the program in disaster science and emergency management from Louisiana residents. Founded in 1971, National University currently enrolls students from all 50 states and 65 countries. It offers more than 100 online and on-campus certificate, credential, associate, bachelor's, and master's programs. The university maintains strong ties with all branches of the U.S. military and holds designation as a Yellow Ribbon School. The Western Association of Schools and Colleges Senior College and University Commission first accredited National University in 1977. The university maintains this accreditation. National University offers a homeland security and emergency management degree online through the School of Professional Studies. Students can also pursue the degree on campus or at several military bases throughout the country. The program comprises 180 quarter units, 72 of which must come from coursework in the major, including approved upper-division electives. Students enroll in classes in domestic security management, interviewing and interrogation, border-transportation security, crisis management, and legal issues of security. The program requires students to complete a two-month supervised senior project prior to graduation. Online courses at National University last for four weeks and students enroll in one course each month. The university accepts applications throughout the year and classes start every month. National University offers reduced tuition for veterans, active military personnel, and their dependents. Touro University Worldwide belongs to the Touro College and University System. The university focuses on adult education and offers bachelor's, master's, and doctoral degrees. It holds accreditation from the Western Association of Schools and Colleges Senior College and University Commission. The university offers an online business administration degree through the School of Business and Management. Students can select from several concentrations, including homeland security emergency disaster management. The program offers six start dates throughout the year without on-campus components. Courses follow an eight-week delivery schedule. Students who complete the program earn a bachelor of science degree in business administration and management. The degree comprises 120 credits, including 45 general education credits, 39 core credits, 24 elective credits, and 12 concentration credits. Emergency management students must take courses about emergency preparedness and response, first and second responders' roles in crisis, homeland security and terrorism, and disaster and emergency. Touro University Worldwide offers a generous transfer policy. The university considers transfer credits from accredited programs or institutions, military training, and standardized testing courses, like the College Level Examination Program. In addition, Touro University Worldwide maintains partnerships with several community colleges that allow students to pay a reduced tuition rate when transferring between partner schools. Crown College began as the Alliance Training Home in 1916. The school became known as Crown College in 1992 after undergoing several name changes. The school maintains affiliation with the Christian and Missionary Alliance. Crown College hosts close to 1,300 students and offers 40 accredited majors. U.S. News & World Report includes the school in the Best Regional Colleges Midwest Ranking (#46). Crown College holds accreditation from the Higher Learning Commission. Crown College offers an online emergency management degree without campus requirements. The program requires at least 125 credits, 36 of which must consist of courses in the major. Disaster and emergency management classes include crisis and risk communication; emergency relief and community development; and disaster response, recovery, and operations management. Students also complete Christian core coursework. Some disaster and emergency management courses transfer to the college's accelerated master's degrees in organizational leadership, global leadership, Christian studies, and master of divinity. Close to 100% of Crown College students receive some type of financial assistance; online students can apply for the same funding opportunities as on-campus enrollees. Online courses follow an asynchronous delivery format, allowing students to access course materials at any time. Founded in 1910, West Texas A&M University hosts more than 10,000 students and offers 59 undergraduate and 38 master's degrees in addition to a doctorate in agriculture. It holds accreditation from the Southern Association of Colleges and Schools Commission on Colleges. The university's College of Education and Social Sciences offers a bachelor of applied arts and science with a major in emergency management administration through the Department of Political Science and Criminal Justice. The emergency management administration program comprises 120 credits, 42 of which must consist of coursework in the major. Students take classes in risk management, public financial administration, principles of emergency management, organizational theory in the public sector, and GIS technology for public and emergency management. Students must complete a comprehensive undergraduate paper before graduation. The department offers all courses for the major online. Applicants need an associate degree (in any major) from an accredited institution. Students can transfer up to 36 technical or vocational credits toward the degree. Established in 1886 as the Territorial Normal School, Arizona State University started as a four-classroom building with 33 students. Today, the university hosts an undergraduate population of over 42,000 and offers 350 undergraduate and more than 400 graduate programs. The university maintains accreditation from the North Central Association Higher Learning Commission. U.S. News & World Report ranks it as the #2 school in its Best Online Bachelor's Programs Ranking. The university's Watts College of Public Affairs offers a bachelor of science degree in public service and public policy with a concentration in emergency management and homeland security. The program comprises 120 credits and students must complete a minimum of 45 credits of major and upper-division coursework. Emergency management and homeland security courses cover subjects such as international terrorism, victims and the criminal justice system, police accountability, and cyber terrorism. Students must complete a senior capstone project. ASU offers online students six start dates each year. Each online course lasts for 7.5 weeks. Non-resident online students pay higher tuition than resident students. Online students can apply to the same scholarship opportunities as on-campus students. Established in 1976, the University of Hawaii West Oahu belongs to the University of Hawaii System. The university enrolls over 3,000 students and offers six bachelor's degrees and seven certificate programs. It holds accreditation from the Western Association of Schools and Colleges Senior College and University Commission. U.S. News & World Report includes the university in the Best Regional Colleges West Rankings (#21). University of Hawaii West Oahu offers a bachelor of arts degree in public administration with five concentrations, including disaster preparedness and emergency management. The degree comprises 120 credits, including 37 general education credits, 27 upper-division core courses, 18 concentration credits, and 35 elective credits. Students must also complete a three-credit capstone course with a senior project or an administrative practicum. Coursework for the disaster preparedness and emergency management concentration meets the national standards set by the Federal Emergency Management Agency and the U.S. Department of Homeland Security. The university does not offer any degree completely online. The school only offers the upper-division coursework of the bachelor of arts degree in public administration online. Only Hawaii residents can enroll in fully online courses. Founded in 1833 by Georgia Baptists, Mercer University began as a preparatory school for boys called Mercer Institute. Today, Mercer University enrolls more than 8,300 students; supports 12 schools and colleges; and offers undergraduate, graduate, and certificate programs in diverse fields. The university holds accreditation from the Southern Association of Colleges and Schools Commission on Colleges. The university offers a homeland security and emergency management degree online through Penfield College. Students can pursue the bachelor of science degree in homeland security and emergency management completely online. The program offers five start dates throughout the year and courses follow an accelerated, eight-week delivery schedule. Mercer University maintains a comprehensive credit transfer policy and students with an associate degree or college credits from an accredited institution can transfer credits toward the degree. Homeland security and emergency management students take 42 credits in the major on subjects like forensic behavior, the effects of disaster on society, and terrorism. Mercer University maintains an Enterprise Learning Partnership with local organizations that provide affordable opportunities for employees when they enroll in the bachelor of science program in homeland security and emergency management, including waived application fees and tuition benefits. Applicants submit letters of recommendation, official transcripts, and SAT or ACT scores. Arkansas Tech University started out in 1909 as the Second District Agricultural School, offering classes that led to a high school diploma. The college achieved university status in 1976 when it took its current name. Arkansas Tech University currently enrolls more than 12,000 students and offers over 140 undergraduate and graduate degrees and more than 15 certificate programs. The university holds accreditation from the Higher Learning Commission of the North Central Association of Colleges and Schools. Arkansas Tech University offers an online emergency management degree through the College of Engineering and Applied Science. The program leads to a bachelor of science degree and holds accreditation by the Foundation for Higher Education Accreditation of Emergency Management. Students enroll in 45 credit hours of emergency management core courses that include classes in public policy and politics in emergency management, principles of disaster relief and recovery, and ethical and legal issues in emergency management. The program requires students to complete an internship comprising at least 400 hours of relevant work experience. The program culminates in a capstone project consisting of an ePortfolio where students document their academic and practical experience throughout the program. Applicants submit transcripts and ACT or SAT scores. From its founding as Drury College in 1873, Drury University set out to provide a strong liberal arts education to southwest Missouri residents. The school occupies a 90-acre campus and hosts more than 3,300 students. It offers more than 70 undergraduate programs and five graduate degrees. The university holds accreditation from the Higher Learning Commission and a place on the Best Regional Universities Midwest Rankings of U.S. News & World Report (#29). Drury University offers an online emergency management degree through the College of Continuing and Professional Studies. Students can pursue the degree without any campus visits. The degree comprises 124 credits hours, 42 of which must consist of coursework in the major. Emergency management students enroll in classes in hazard identification, disaster planning and preparedness, and public information management. Students must complete a six-credit internship prior to graduation. Students graduate from the program with a bachelor of science degree. Some online courses at the university follow a 16-week semester schedule, while others follow an eight-week accelerated format. Students can take a maximum of 17 credit hours per semester or seven credit hours in an eight-week block per semester. Applicants submit official transcripts, SAT or ACT scores, and a writing sample. Established as the State Normal School for the Second Normal District of Missouri, the University of Central Missouri achieved university status in 1972. It holds accreditation from the Higher Learning Commission of the North Central Association of Colleges and Schools. The University of Central Missouri offers a bachelor of science degree in crisis and disaster management with four focus areas, including emergency management. The program comprises 120 semester hours, 36 of which must consist of crisis and disaster management core coursework and an additional 12 semester hours in the focus area. General education requirements and elective courses make up the remaining semester hours. Students pursuing the emergency management focus must enroll in a three-credit approved technical elective and courses in emergency responder safety and health, emergency services management, and personnel management. The university charges nonresident online students the same tuition as resident students. Additionally, online students can apply for the same scholarship opportunities as on-campus students. Applicants submit official transcripts and ACT or SAT scores. Everglades University began as American Flyers College in 1990. The school changed its name to Everglades College in 2000 when it expanded its degree offerings to include non-aviation-related disciplines. Three years later, it achieved university status. The university holds accreditation by the Commission on Colleges of the Southern Association of Colleges and Schools. Everglades University offers a bachelor of science degree with a major in crisis and disaster management. Students can pursue the degree online or on campus. The program comprises 123 credits, including 54 credits of major coursework on topics such as crisis and disaster psychology, emergency management and public policy, and business continuity planning and management. The program requires students to complete a three-credit capstone course to earn the degree. The university maintains a generous transfer credit policy. Approved prior learning credits can replace up to 21 credits of interdisciplinary coursework. Everglades University only considers transfer credits from regionally accredited schools. Online students can access the same student services as on-campus enrollees, including academic advising, tutoring, and career coaching. According to the Bureau of Labor Statistics (BLS), tech-related jobs in emergency management are projected to grow significantly. Positions as computer and information systems managers and information security analysts are projected to grow by 15% or more between 2014 and 2024. Other common jobs in the field are projected to grow at average or slightly below-average rates. A complete breakdown can be found in the table below. The earning potential for college graduates in emergency management will largely depend on their specialization in the field. According to the 2015-16 PayScale College Salary Report, the most lucrative subfields in emergency management include information security, transportation/logistics management, supply chain management, and computer/network administration. The table below highlights salary projections for different emergency management fields during two key career stages. Of the seven majors listed on the table, transportation and logistics management professionals are projected to have the highest rate of salary growth, with a 65.0% increase between entry-level and mid-career positions. Criminal justice administration ranked second with 63.8% projected growth. In addition to your major and degree specialization, your salary expectations will also depend on a few other factors, including your specific job title, the size of your company, and your location. With that information in mind, take a look at the following table, which features career salary growth projections for five common emergency management pathways. All of these careers are projected to have at least 40% salary growth after 20 years in the workforce. Disaster recovery coordinators experienced the highest rate of growth, with an 84.2% projected increase in salary between early-career and late-career. Students who earn a bachelor's in emergency management will leave school qualified for dozens of positions in the field; those with specialized degrees and work experience will be particularly well-positioned for this competitive and demanding profession. Below, we've covered four of the most common professional pathways for emergency management graduates. Emergency Management Directors: These professionals oversee teams who operate at different stages of emergency preparedness and response. They create comprehensive contingency plans designed to mitigate threats against human life, property, and natural resources. They also help with relief efforts when emergency situations occur. Logisticians: These professionals specialize in organizing supply chain needs for companies and organizations. In emergency management, logisticians coordinate transportation, medicine, medical equipment, and other relief services. They also develop strategies for delivering essential goods and provisions in the wake of disasters, attacks, and other emergencies. Computer and Information Systems Managers: Computer and information systems managers oversee the day-to-day computing and IT operations at companies and organizations. They meet with government officials and other leaders to determine specific tech needs, and then perform upgrades and introduce new systems to help their organization operate efficiently. Information Security Analysts: These tech professionals run software programs and perform tests to evaluate the security of an organization's computing systems. They are trained to handle hackers, cyberterrorists, and other online criminals, along with viruses, malfunctioning equipment, and other technical issues that can compromise information security. Making connections and learning as much as you can about emergency management is crucial to your professional success. Professional organizations offer a great entry point for students who want to learn more about their chosen career path. Below, you'll find information about three of the country's most prominent organizations established for emergency management professionals. These organizations host networking events, provide online training, maintain active job boards, and offer other services for career-ready college graduates.